Sussex batsman Phil Salt is reaping the rewards for spotting an opportunity – and seizing it. 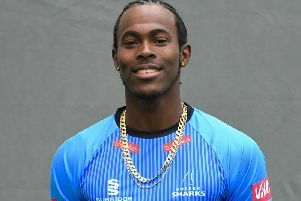 The 21-year-old had only played seven first-class games before this season, his reputation at Hove predominantly that of a one-day ball striker. But when Chris Nash left Sussex to join Nottinghamshire it created a vacancy at the top of the order. Salt saw his chance. He opened the batting in Adelaide grade cricket during the winter and was given the job of Luke Wells’ partner when the County Championship campaign began. It has been a hazardous occupation during the damp, bowler-friendly early weeks of the season and not just for Salt. But he has averaged 26 in five innings and there was plenty of evidence in the 63 he made against Gloucestershire last week – the only half-century of a low-scoring contest – that he is getting to grips with the challenge of taking on the new ball while still trying to play attacking shots. He said: “I had an idea there would be a vacancy and it was a role I wanted to take on. I opened in Adelaide and did okay and I’ve been working a lot with (batting coach) Mike Yardy, who has lots of experience of facing the new ball. “We talked about was processes and having a method which is repeatable over after over, day after day. I have made a couple of errors against the new ball which maybe I would have got away with batting further down the order or if it was later in the season. Like Nash, Salt tries to be aggressive. In contrast, Wells is more of an accumulator but it’s a partnership that already seems to be working well. “We are very different cricketers,” said Salt. “He’s always in my ear reminding me what I do well and I’m always on at him in the same way. We bounce off each other really well. Salt has an interesting back story. Although he was born in North Wales, he spent much of his childhood in Barbados. There, he picked up some batting advice from former West Indies opener Gordon Greenidge when he practised at the Wanderers club. He won a scholarship to Reed School where Keith Medlycott, the former Surrey player, spotted him and recommended him to Sussex. Last October he signed a new two-year contract, having progressed through the club’s Academy. Head Coach Jason Gillespie is delighted with his progress. Sussex take on Middlesex at Hove on Friday in a key game for two sides tipped for promotion. Ishant Sharma’s participation depends on his recovery from a sore shoulder. If the Indian pacer doesn’t make it Stuart Whittingham or left-armer George Garton, who has recovered from a side injury, will take his place.